Josh Homme used it to prove that you don't need an expensive fancy guitar to get a great sound. "I’ve got a Les Paul Junior double cutaway that I made myself with P-90s and an Epiphone Dot that I really love that I played on it." In the photo you can clearly see Paul Arthurs (Bonehead) using an Epiphone Dot. Sonic Youth's [website](http://www.sonicyouth.com/mustang/eq/gtr120.html) provides this photo of the Epiphone Dot used by Lee Ranaldo, and states: "Used by Lee: 2006-2009 2006 -- F#F#AAEE (Shadow of a Doubt) 2009 -- F#F#AAEE (Shadow of a Doubt) NOTES: A replacement for Lee's old Epiphone Casino, which broke. Red body 2 pickups Black pickguard Rosewood fretboard 1 toggle switch 4 knobs Bigsby style tremolo"
We can see, Jimmy play on it live in 2008. 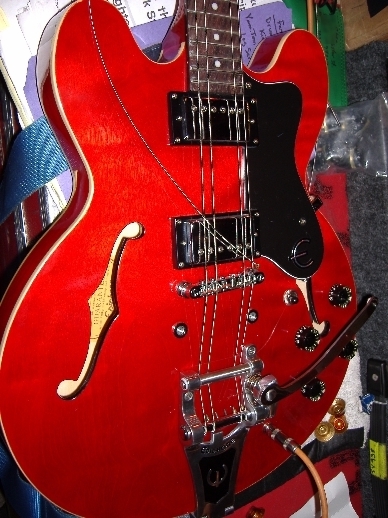 Gustaf Norén uses an Epiphone Dot Cherry MIK which he later destroys at Hultsfredsfestivalen. However he uses a MIC Dot as a backup at various stages throughout the Ode To Ochrasy tour. This Epiphone Dot was used mostly during shows in the *Airing of Grievances*-era. It was Patrick's main guitar for that time. "The main guitar I've played for the last four years is an Epiphone Sheraton II. It was a birthday gift from my extended family so it has some of that good mojo going for it. I used it on the Posies Blood/Candy tour along with an Epiphone Dot as backup and an Epiphone J-160 that I played on a couple of songs on stage and did all radio and television unplugged type of things with. The Sheraton has done me right and it even ended up on Brendan's last record too, on the song, "I'll Never Tell"." in this article, will johnson talks about his epiphone dot. "I bought this cheap Epiphone Dot back in 1998, spray painted it all black in 2003 & it sat in a case until 2 days ago. Stripped the paint, cleaned it and gave it a set up. It was the guitar that got me in to hollowbodies. It still needs a few things but It's good to have it in working order again & the Classic 57 pickups still sound amazing!" In this picture, Epiphone Dot can be seen. “For bowed guitar, I use an Epiphone Les Paul, I have an Epiphone Dot that I’ve replaced all the pickups and electronics on, and my main guitar is an Eastwood Airline ’59 Coronado. " He uses/d epiphone dots as the guitars to break on stage, as they're cheaper. He uses a sunburst epiphone Dot in the music video for "Somos Ajenos" and during various live performances in that era. In this photo, Shanshiashvili can be seen playing the sunburst Epiphone Dot. His Epiphone Dot in Cherry Red is one of his back-up guitars. At 0:11 you can see him using this guitar. When Mickey plays bass for Ben Howard/A Blaze Of Feather he uses a Red epiphone dot. I absolutely love this guitar! I put on some seymour duncan puppies and it became my number one choice for live acts. I Call Her Big Red. I lucked out and found a lefty that had already been modded. With open-coiled Gibson pickups ('57 Classic, neck/498T, bridge), and a wrap-around Bigsby Vibrato tailpiece, this thing gives me the dynamic control, shapeable feedback, and overall versatility to play just about anything I want. My main guitar is a Sunburst Dot with gold hardware. Everything is stock. It's good for it's price range, pick ups give a warm fuzzy sound great for The Strokes' sounds. One complain is that the tone knob on the Bridge Pickup is a little loose but nothing else seems to be affected. Loose as in the knob is loose or the entire pot is loose? one of the best axes you can buy for under £500!! I love this guitar so much, it may not be a expensive model but I think its a players guitar, plues it stays in tune like a dream thanks to quality tuners...excellent!! Nice alternative tone; little use live. The semi-hollow tone is something I wanted to experiment with, and the dot was an affordable way to try it out. In use, I like the sound, but find the neck very slim and narrow to use. Also, from the placement of the neck in the body, the neck seems long; third fret too far away. Obviously these things can be got used to, but the greatest shortcoming for me is that my guitar is prone to feedback at rehearsal / gig volumes so it doesn't really get the playing time it probably deserves. Nice for a change though. Nicely made and attractive appearance. Go Gibson or if you wanna save money (like I do) vintage MIJ, you'll get a big boy's neck and all around better quality. You are looking for a 42 to 44mm nut width with a '64 or earlier profile. also, a good 335 type guitar is not terribly feedback prone unless you play with heaps of gain. There is a trick to standing out of certain "feedback spots" around the amp though.... and thens tepping into them when you want to bring on a little musical feedback like Pete Townshend. The Dot is Gibson quality. I mostly play grunge and punk rock, but when I need to play blues or more classic rock, this is the guitar. My Dot cost around $400.00, and gives you the warm hollow body sound for an affordable price. Very classic and whole sound for the price. It sounds very good compared to other budget guitars I've seen. It plays jazz, blues, funk, and other genres clearly with a warm tone. i have been looking for a new guitar and being a arctic monkeys fan and oasis fan ive been wanting a es-335 and got one and feels great,plays great!! This guitar has now been my main go-to guitar for the last 2 months, and I love it! If you're searching for a good hollow-body guitar that's got a good sound, nice feel and got room to play, then this guitar is definitely something for you. I bought it after I joined my new band where we play a lot of rock/blues music. Before that I used to play on a Jim Root Signature Fender Telecaster, which had a little bit too big of a "crunch" for the sound we were aiming for, so I went out and looked through several Strats, Teles, and some other hollow bodies, like the Sheraton, but this one was the one that won my heart. And at that price I was sold! So if you want a good hollow-body guitar at a decent price, then this is your baby! This guitar proves you don't need an expensive peice of gear to get an amazing sound. Sound pickups neck controls look. not a problem here! Sounds great and plays great, but the pickup selector switch needs to be swapped out just like most new epiphones. It goes out after a few months of playing it. I got this used dot as a guitar that I could take to school (when I was in high school years ago), and I needed something that was moderately priced and still sounded great. I got it home and was playing around with it and it sounded almost as good as my Les Paul, so, I decided to change the strings and when I got the strings off, I took out the pickups to see what they were, and whoever had it before me put a set of 57' Classics in it! This is by far the best sounding semi-hollowbody I've ever played (including Gibsons line). The neck is nice and fat like a vintage guitar should be. I have since then taken off the pick guard (I'm weird) and it shows how pretty the maple grain is on the top! I highly recommend this guitar for anyone who is looking to delve into hollowbody guitars. I bought this guitar just because I wanted a bluesy looking one, and I´ve got to say I just fell in love with it. This guitar feels and looks great when you play it. It really has a great sound, kind of jazzy and bluesy, great to play along with others or to play some solos, even with a looper you could make great things because of it´s differents settings. Pretty great semi hollow, especially for the money, though could do with better pickups. Decent guitar good for blues and classic rock. 2 vol. knobs and 2 tone knobs. Tune-O-Matic bridge. This is a really good guitar for blues and classic rock. Has a nice smooth sound on the clean settings. Loud when unplugged it is a nice semi-hollow. If you can't afford a Gibson 335 then an Epiphone Dot is a good alternative for a fraction of the cost. The build quality is good with decent finishing. You can upgrade them with new wiring and Gibson pups to improve an already good sound. I have a Korean made Dot which receive favourable reviews but equally the Chinese Dots seem to get good reviews too. I've been impressed with my Epiphone Dot overall and would recommend them. the Chinese dots aren't as good... don't listen to people.